Reverend Barbara Marie Babish, Ph.D. enjoys the life purpose of assisting others in deepening and strengthening their Spiritual Connection. She is successful in doing this by providing Divinely Inspired Services. Barbara Marie began her own conscious spiritual growth journey in 1996 when she was looking for help with migraine headaches. After having sessions with Therapeutic Touch and Reiki she decided to learn them both to help others as she had been helped.Because of her designation as Empowered Spiritual Life Coach, she has experience in many healing modalities and coaching styles. Over the years, with the help of many spiritual courses and retreats, her own spiritual gifts grew rapidly. She has always been willing to accept more gifts and to use these gifts with wisdom. Today she enjoys sharing her spiritual gifts in all of her client sessions. The Language of Light has been a sacred gift for forty years and has touched the lives of those around her in a powerful way. She is able to use it in all areas of her spiritual work. Barbara Marie has a firm foundation in Ecumenism and offers services to clients from all religious faiths. The services are of a spiritual nature and so people of all faiths can feel secure that they will be served with the greatest respect. Learning important lessons from several religious beliefs is what has helped Barbara Marie understand that the spiritual connection is the key to our life purpose and to our happiness. 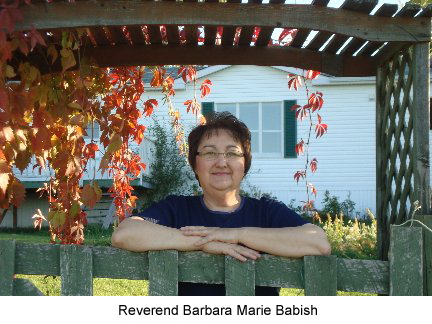 As a past member of several Peace groups, Barbara Marie has learned the value of daily prayer and meditation. Through these groups she has integrated the core values of Simplicity, Reverence and Authenticity. You will witness these values in all her services. Over the last 18 years, Barbara Marie has grown with the help of her “Four Pillars”, ArchAngel Michael, ArchAngel Gabriel, ArchAngel Raphael, and ArchAngel Uriel. She laughs when she remembers that she never even knew there was an ArchAngel Uriel, until he spoke to her! As you can see Barbara Marie is in harmony with her own Guidance by the Holy Spirit and her own personal Spiritual Team of helpers. She is most passionate about spirituality and spiritual growth. If you choose to take part in any of Barbara Marie’s products and services, know that you are not just getting the benefit of Barbara Marie’s wisdom and knowledge but also that of her whole spiritual team.